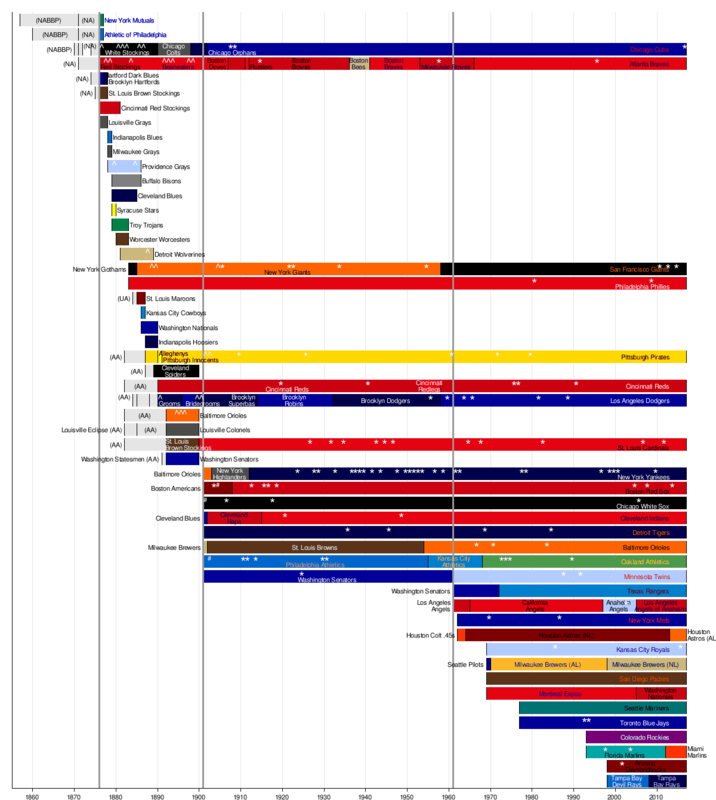 The following is a timeline of franchise evolution in Major League Baseball. The histories of franchises in the National Association of Base Ball Players (NABBP), National Association of Professional Base Ball Players (NA), Union Association (UA), and American Association (AA) before they joined the National League are also included. The charter members of the American League had all been members of the minor league Western League prior to it becoming a competing major league. The first line is the formation of the National League in 1876, and the second is the transformation of the American League to a major league in 1901. The third line is the beginning of the expansion era in 1961. World Series Championships are shown with a "*", National League Pennants before the World Series are shown with a "^", and American League Pennants before the World Series "#". No World Series was played in 1904, so the pennant winners for each league are indicated. Due to the 1994-95 Major League Baseball strike, there were no pennant winners or World Series in 1994, so this year is left blank.